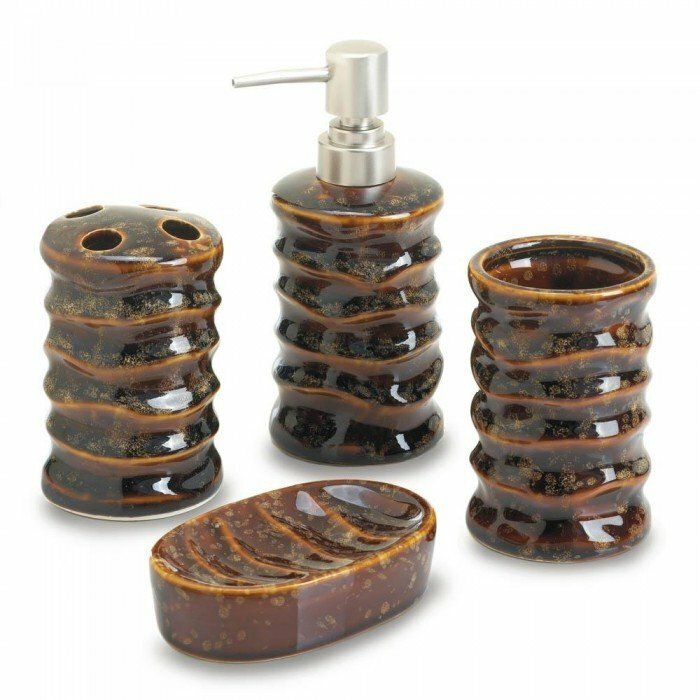 BROWN STONY BATH ACCESSORY SET by Accent Plus home decor, jewelry, decor, decorations, electronics, fountains, floor mats, art glass, vases, garden essentials, fireplace screens. This porcelain four-piece bath accessory set has a cool stone-like finish that will make your bathroom look luxurious. The set comes with a soap dispenser with silver pump, four-slot toothbrush holder, cup, and oval soap dish. Lotion dispenser: 3" x 2 7/8" x 6" high, tumbler: 2 7/8" x 2 7/8" x 4" high, toothbrush holder: 2 7/8" x 2 7/8" x 4 5/8" high, soap dish: 4" x 3" x 1 1/8" high. Material(s): PORCELAIN. Weight 2.64 pounds. Dimensions 3" x 3" x 6.75".